Ballymore has a busy week ahead with runners at Randwick and Sale on Wednesday and Ballarat on Thursday. We are hoping for some rain in Sydney during the next couple of days with both of our Randwick runners, Zazparella and Murcielaga horses who appreciate a bit of sting out of the ground. Stepping up to 1800m fourth up in the Cellarbrations Handicap, Zazparella strips hard fit with Michael Moroney noting that "she has had enough racing now to be showing something." "She probably wants it a bit further on a good track but if there was any rain about her chances would definitely increase," he said, recalling the Al Maher mare's two heavy track victories. Lining up in the following race, the Tab Multi Handicap, Murcielaga is also a wet track winner although he was far from disgraced when fifth on good going at Canterbury last time out. "That was his first run the Sydney way of going and he got a bit lost. He has stayed up there since and has had a bit of practice and he should improve." "He has drawn out but that is actually a help to him as he has always been a horse who appreciates clear running." Two-year-old Gold Kroner debuts over 1206m at Sale and we are looking forward to seeing the handsome son of Choisir (sire of our most recent juvenile winner Misty Waters) in action. "He is a really lovely colt," Moroney enthused - " an outstanding type." A recent jump-out winner, Gold Kroner is a horse who has shown good gate speed and from barrier five is expected to put in a bold showing. Resuming in the 3Y0 Maiden Plate, Lord Disick was sound at his first two outings last winter/spring and he is a more mature horse this time in. "He has had a couple of jump-outs in preparation for this and he has a couple of gear changes (including a one-eyed blinker) as he just wanted to lay in at his first two runs." "We have always thought he'd make a nice autumn three-year-old though being a son of Pentire he is going to be better over a bit longer- whatever he shows first up he will improve upon." Last start Sandown winner Our Valdivia also heads to Sale, due to line up in the 1615m Showcase. "We don't do a lot with him in between runs so it is hard to get a line on him," Moroney said, noting that the Don Eduardo four-year-old has already had nine runs this preparation - "but he has been eating up well and he looks bright in himself." "He has been doing a great job and it was a terrific win last start - he again looks the one to beat." We will be cheering on three nice types at Ballarat on Thursday including Simply Explosive and Sun Holiday in the 1400m Maiden Plate. Whilst not managing a placing in his first three runs last spring, the son of Pins showed enough at home to warrant taking his place in the Geelong Classic. "He showed glimpses last time in," said Moroney, admitting that he has been a tricky horse to work out. "With the blinkers on he wanted to charge, with them off he didn't want to do anything! 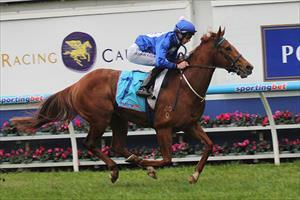 But he has been gelded since so the blinkers come off and hopefully he can turn his form around." Drawn next to Simply Explosive, Sun Holiday is also resuming having been unplaced at his first two spring runs. "He has really improved during the break," Moroney said, adding that "he is a typical High Chaparral. As young horses they are backward in both mind and body - and you need to wait until the penny drops which it has done with this fellow." "We have been pleased with him this time in and we think he can improve pretty quickly." Jemerica (pictured) is our other Sale runner, taking her place in the 1200m Showcase. Fitter for three recent runs, the Captain Rio mare has been working well at home - "we have been really happy with her," Moroney said, "and any rain about would enhance her prospects."